It's black Friday today. I was getting my hair cut, and the cosmetologist asked me if I knew where the name originated. I had no idea. She said maybe it is because people stand in lines all night in the dark. It seems plausible. I went to work today because I am saving my vacation time for Christmas, but I did stop by Loft this evening and bought a pretty, red blouse. 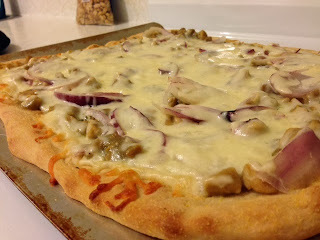 Curry pizza is a weird thing to be blogging about the day after Thanksgiving, but that is the way I roll. Look at all that wonderful cheese! 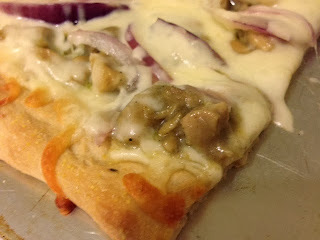 If you like green curry, you should make this pizza. If you don't like green curry, you should try it again because it's amazing. The ingredients are 1 cup coconut milk, 2 tablespoons green curry paste, 1/2 teaspoon garam masala, 1 tablespoon cornstarch, 2 tablespoons fish sauce, 2 boneless skinless chicken thighs, pizza dough, half a red onion, 12 ounces mozzarella cheese, and salted peanuts. I began by removing 2 tablespoons of coconut milk from the cup and combining it with the cornstarch. I also added the fish sauce to this concoction because I realized 2 tablespoon of coconut milk isn't enough liquid to dissolve an entire tablespoon of cornstarch. I added the coconut and curry paste to a frying pan and stirred. I added the finely cubed chicken and garam masala. I cooked this until the chicken was no longer pink. I then added the cornstarch slurry. That is a wonderful word to describe food. It makes it sound like toxic waste. I cooked it until the curry has a nice, thick sauce consistency. This is the curry. This is pretty potent stuff. I added one less cup of coconut milk because I didn't want the curry to be to liquid. I worked out fine in the end because the crust and cheese mellow out the curry. If replicating this recipe, I would use the same quantities. I cooked my dough for 10 minutes at 400 degrees. This really depends on the dough you are using. You would need to pre-bake the crust a little so it isn't soggy. I added the curry. The sauce thickens nicely due to the cornstarch. 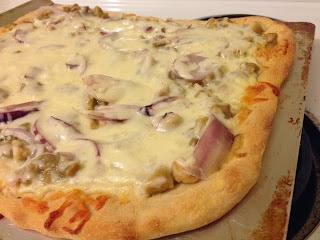 I added red onions. I don't know if red onions are are typically in green curry, but I really like them. I used 12 ounces of cheese. It is possible 10 ounces would have been enough, but when it comes to cheese, more is better. I put the pizza back into the oven for another 10 minutes. After it finished baking, I sprinkled the top with salty peanuts. This was a great pizza. Really. 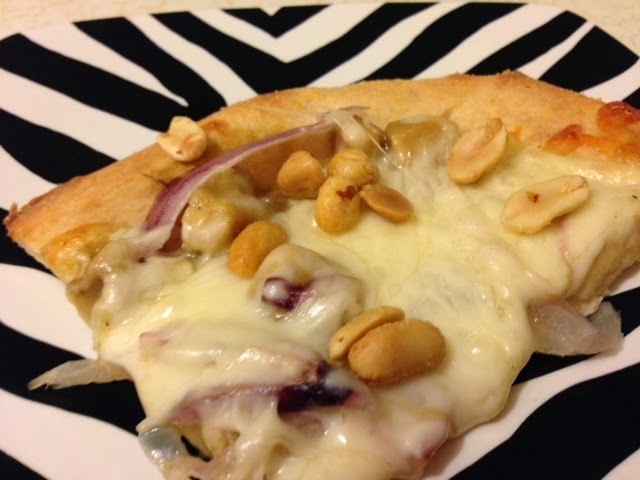 You might be tempted to not add peanuts, but that would be a huge mistake. 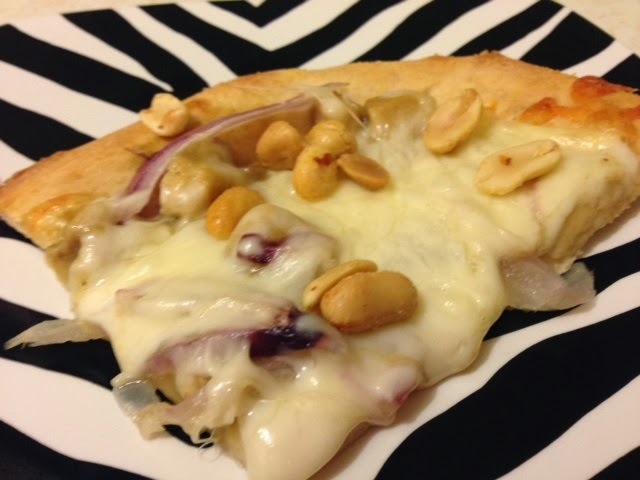 If I were you, I would make this pizza. You won't regret it.